The Venerable Martyr David was from the town of Kydonies (Aivali) in Asia Minor, which had a special relationship with Mount Athos, as two dependencies were there: one belonging to Iveron Monastery and the other to Pantokratoros Monastery. 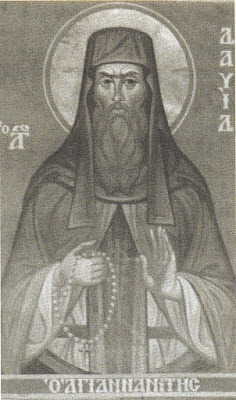 Therefore when David decided to become a monastic, he went to Mount Athos, specifically to the Skete of Saint Anna, where a compatriot of his was living. In order to repair damages to the Church of the Transfiguration on the peak of Mount Athos caused by lightning and to the Church of the Theotokos, David was sent to Smyrna to raise funds. After raising sufficient funds David returned to Mount Athos, where the two churches were repaired, and they also built two containers for water and a row of cells for pilgrims. At some point after this, David was overwhelmed with a desire to undergo martyrdom. For this reason he traveled to Magnesia in Asia Minor where he proclaimed Christ publicly. Apprehended by the Turks, he was severely beaten, wounded in the head, and expelled. Therefore, without fulfilling his desire for martyrdom, he returned to the Skete of Saint Anna. There he confessed to his spiritual father his fervent desire for martyrdom, but fearing lest David deny his faith under torture, he was denied permission to leave. David therefore went to Karyes where he did receive permission and the blessing from the former Metropolitan Pankratios of Christoupolis. From the Holy Mountain, David traveled to Thessaloniki where he heard a monk from the Skete of Saint Demetrios, a dependency of Vatopaidi Monastery, had converted to Islam. David set out to persuade this monk to return to his Christian faith, but in vain. His intentions became known to some Muslims, who apprehended him and brought him before the judge. Because the judge feared David would succeed in reconverting the former monk, he gave a quick sentence. David was ordered to be hanged that night. Therefore, on the night of 26 June in 1813, Venerable David of Kydonies fulfilled his longed for desire to die for the love of Jesus Christ, and was hanged, thus receiving the unfading crown of martyrdom.